As the Vikings try to set their offensive line up for the 2018 season, one of the most versatile members of the group will get a chance to explore the open market. 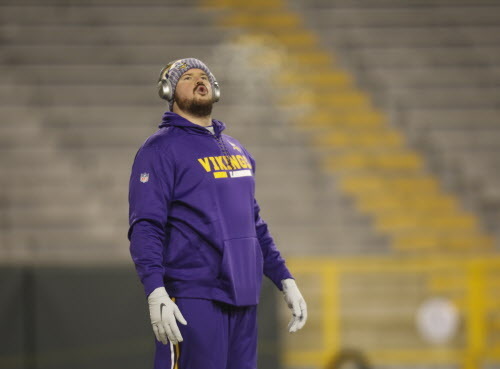 Jeremiah Sirles’ agent, Chris Gittings, told the Star Tribune on Friday that the Vikings will not place a restricted free agent tender on the 26-year-old lineman. The team, Gittings said, wants Sirles back for the 2018 season, and plans to make him a contract offer. But after Sirles started 14 games the past two seasons in Minnesota, the Vikings could have some competition for him. He’s seen time at both guard and tackle in Minnesota, and particularly once Pat Elflein’s shoulder injury sapped the Vikings’ depth at the end of the season, the team regarded Sirles as its first backup option at all five line positions. That versatility could command a market for the former undrafted free agent, who would have cost the Vikings $1.9 million for the 2018 season if they had placed the lowest tender on him and retained the right of first refusal on any contract another team might have given him. The Vikings’ move with Sirles comes as the team tries to calibrate its position at quarterback, where they will consider whether to sign one of their three pending free agents (Case Keenum, Teddy Bridgewater and Sam Bradford) or determine how deep they’re willing to dive into the bidding for Washington’s Kirk Cousins. Mike Remmers, who played guard at the end of last season, could also move there in 2018 as the Vikings weigh their tackle options for next season. Sirles’ most likely spot to start would figure to be at guard, and a Remmers move there could limit his options. If the Vikings resign Sirles, it figures to be on a deal that would allow them more control of the salary cap figure than a RFA tender would give them. They could try to structure a deal that would give Sirles a lower cap figure than $1.9 million in 2018, which would free up more dollars for the Vikings’ quarterback move, among other things.